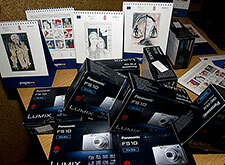 Dejan Marinović, a student of the Nova Varoš Technical Secondary School, Maida Hadžalić, a student of the Prijepolje High School, and Hekuran Maliqi, a student of the Preševo High School, won the UNOPS Progres 2011 Calendar Competition. At the awards ceremony in the Toplice National Museum, Swiss Ambassador H.E. Erwin Hofer awarded each of the three winners a laptop and the winner among secondary school in Grdelica, on a basis of demonstrated commitment and overall quality of illustrations, a check for 150,000 dinars to purchase the necessary school equipment. 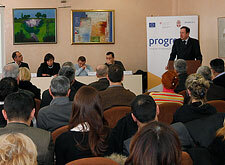 The European Partnership with Municipalities Programme – PROGRES organised seminars in Novi Pazar and Vranje in early February 2011 on topic “What is and Why We Need Good Governance”. The European Partnership with Municipalities Programme – PROGRES and the Center for Free Elections and Democracy - CeSID presented findings of the survey Citizens Satisfaction with Lifess in Local Communities, that was carried out in 25 municipalities of South and Southwest of Serbia during the past two months. Representatives of the European Partnership with Municipalities Programme – PROGRES have handed over to Kraljevo Mayor, Ljubiša Simović, the reports about damage on 19 public buildings, total surface covering 21,000 m² that was caused during November earthquake.